Saudi Arabian Oil Company, commonly known as Saudi Aramco, is a Saudi Arabian national petroleum and natural gas company based in Dhahran. Over the past 80 years it has become a world leader in hydrocarbons exploration, production, refining, distribution and marketing. The company conducts an array of other activities on behalf of the government. These functions have included operating hospitals, running education programmes and building sports stadiums. At the beginning the company was controlled by a consortium of US oil companies but afterwards it was nationalized in the 1980s. 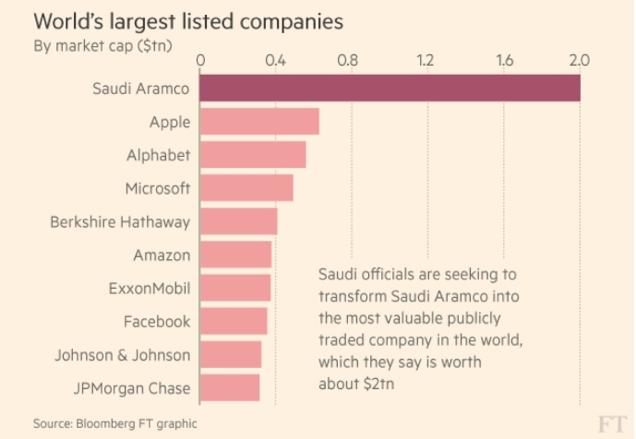 Aramco has planned to sell a stake of about 5 percent could value the company in trillions of dollars. Nowadays the company would be worth 2.5 trillion dollars. In fact, the expected amount being raised is approximately 100 billion dollars. The company seeks to double its total production capacity for natural gas, including shale gas, from 12 billion cubic feet per day over the next 10 years. Efforts are focused on making float consistent only with core operations thus avoiding any non-strategic activity being included in the deal. Under the plan of IPO, the Saudi government will remain the controlling shareholder, having the final say over production levels and management of the kingdom’s oil reserves. ​Moelis&Co has been chosen as the main advisor for the largest IPO ever. Saudi Arabia's state-owned energy company has told J.P. Morgan, HSBC and Morgan Stanley they will be the lead underwriters for its planned initial public offering. Saudi Arabia’s domestic stock exchange has a total market capitalization of about $440 billion, making it the largest in the Middle East. A sale of just 5 percent of Aramco would mean absorption of the whole deal on the local exchange would be near impossible. For these reasons, the board of directors, jointly with advisors, are seeking, among a variety of choices, the most appropriate stock exchange where placing shares in order to increase the visibility on the markets and, at the same time, to raise as much capital as possible. Hong Kong is among markets including London, New York, Singapore and Tokyo that have been identified as possible venues. Gordon Kwan, head of Asia-Pacific oil and gas research at Nomura Holdings Inc. in Hong Kong, has said: “China needs to ensure oil supplies from Saudi Arabia, given the structural decline of the country’s aging mature fields. Saudi Arabia can ensure market share in China, which might want to insist Aramco be listed in Hong Kong instead of London or the U.S.”. As Singapore is willing to host the international listing, for this purpose it is inviting one of its state investment companies to become an investor in the initial public offering. Moreover, the country is also looking at different kinds of cooperation with the Saudi government on future investments. New York and London are favourites to lead an international listing. The problem with these 2 stock exchanges is the degree of information and data to be disclosed in order to be listed in. Companies on LSE are required to have a float not less of 25% that is five times the float desired by Aramco although in certain circumstances authorities can reduce such threshold. LSE could be seen as a natural choice thanks to the presence of some of the world’s biggest resource companies. NYSE is appreciated because of its number of investors, trading volume and range of communities that assist companies in their day to day trading life. Being a foreign private issuer, the company would also be exempt from some onerous reporting requirements imposed on US companies such as disclosure of non-public info to analysts. Currently, it is still uncertain where Saudi Aramco will place its shares because countries are planning incentives to lure the listing in their home stock exchange. Let’s wait and see what will happen.